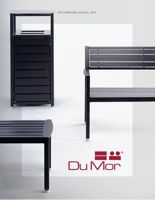 DuMor's 2019 Catalog features updates to the 500 series plus a new recycled plastic option! Wood grain recycled plastic is extruded with a multicolor tonal streaking and etched with a wood grain texture to achieve a realistic wood like appearance and feel. To truly appreciate this product it needs to be seen and handled, ask your rep for a free sample. Plastic lumber is comprised of 95% recycled content. Only available on select products.